Tenali Ramakrishna Kavi - How an Elephants' fleet junks in a mosquito's throat? Among the Ashta Diggajas in the Bhuvana Vijayam of Sri Krishna Deva Rayalu, the King for his ingenuity, quick wittedness, and fast filling of stanzas when at test particularly favoured Ramalinga. Rayalu was renowned as Andhra Bhoja and Poets Paradise. With his inherent qualities of wit and sarcasm, Ramalinga was growing big and closer to Rayalu day after day. With no change in the rule, the more you grow the more envious you become, the other courtiers like Rama Raja Bhushana were against the growth of Ramalingas association with the King Rayalu. Whenever there is a possibility, those courtiers, and Rama Raja Bhushana had been working out for damaging Ramalingas image and sling mud on him before the King. Ramalinga efficiently countered these efforts and trials of courtiers all the time. At one stage, as these personalities were unable to compete with Ramalinga in wit and ingenuity decided to humiliate Ramalinga. They handed over the responsibility of insulting Ramalinga to the main entrance guards. Those poor soldiers were lured by the bribe amount courtiers had offered them. A line was given to those guards for stopping Ramalinga at the entrance itself. The line was “Kunjara Yudhambu Doma Kuthuka Jochen” meaning an elephants’ fleet is stuck in a mosquito’s throat. Sanjathamu Goodi Kallu Chavi Gonnava? Long before those guards could understand the meaning of the poem, Ramalinga walked stiff into the main court hall. After sometime, while the King Rayalu was into one of the pleasure rounds of literary discussions, the guards entered the hall and complained that Ramalinga disgraced them with the poem at the main entrance. 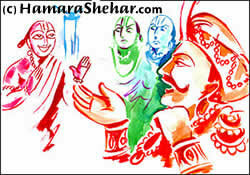 After listening to all the details narrated by the guards, Rayalu ordered Ramalinga to extempore compose a poem taking the same end line with a situation in Mahabharatha. Pandavas in Mahabharatha are like a fleet of powerful elephants. Losing in the gamble with Kauravas, they had to live incognito for some time. During this period they served a weak ruler Virata. By all Gods! It is the fate of those Pandavas to serve such a weak person in spite of being renowned warriors. This is similar to a fleet of strong elephants being stuck in the throat of a small mosquito. Rayalu clapped in all praise of Ramalinga for his ingenuity and wit filled narration. In the full house, Rayalu hugged Ramalinga and appreciated him agreeing that Ramalinga’s words are like double-edged swords. This state of affairs brought Ramalinga more close to Rayalu. All the attempts to trap Ramalinga and cut down his image before the King Rayalu by the envied courtiers and poet Rama Raja Bhushana blew off like a piece of raw cotton in Ramalinga’s intelligence whirlwind.